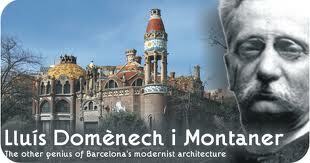 On the 21st of December in 1850, the Catalan modernist architect Lluís Domènech i Montaner was born. Domènech is often hailed as the most modern of the modernistas, notably for his mastery of lightweight steel construction with which he built monuments across the Catalan landscape in the style and spirit of the Renaixença (Renaissance). Unesco, at least, does not give him short shrift, having designated his most important buildings in Barcelona a World Heritage Site. Lluís Domènech started out studying Physics and Natural Sciences at university but changed to architecture shortly afterwards. Domènech studied at the Madrid school of architecture, the Real Academia de Bellas Artes de San Fernando, from which he graduated in 1873. Two years later, in 1873, Lluís Domènech joined the School of Architecture in Barcelona, the ‘Escola d’Arquitectura’, as a teacher and in just another two years he had become a professor. In 1900, Domènech had become the Director of the School of Architecture. Barcelona, at the turn of the 20th century, was the right place at the right time for architects. Nineteenth-century industrialisation brought tremendous wealth, and between the Universal Exposition of 1888 (for which Domènech created the Castell dels tres dracs) and the construction of the Eixample — the vast grid of streets laid out in 1859 to decongest the old city — there was a heady mix of civic pride and social ascension in the air. The rising middle class was eager to make its mark on the rapidly growing city, and the new modernista style seemed perfectly suited to this task, rife as it was with neo-Gothic motifs that linked the newly minted mercantile titans to Barcelona’s rich medieval history. Domènech’s most “complete interior” is the 1908 Palau de la Música Catalana, a stunning concert hall miraculously shoehorned into a small lot at the junction of the old city and the new. Often likened to a conductor, Domènech knew how to get the best performance from the sculptors, ceramicists and woodworkers who executed his designs. Indeed, nearly every surface inside the auditorium has been adorned with colour, texture and relief and, because the walls and ceiling are made almost entirely of stained glass, coloured light. Atop the balcony’s mosaic-clad columns, bronze chandeliers tilt like sunflowers toward the stained-glass sun that seems to float in midair from the ceiling’s inverted dome. The astonishing expanses of glass were achieved with the use of structural steel — invisible beneath so much decoration. The other pillar of Domènech’s World Heritage status is the Hospital de la Santa Creu i Sant Pau, set on 40 park-like acres at the northern edge of the Eixample. Heeding the latest theories of hygiene, Domènech envisioned a complex of 20 pavilions to ensure ventilation and access to sunshine. He ingeniously sunk the corridors and service areas of the hospital underground so that patients and visitors in the pavilions and gardens above would feel as if they were in a village — a fantastical one with myriad domes, spires, finials, sculptures and mosaics. Currently, the 12 pavilions Domènech built (his architect son completed the last eight) are being restored; some will become a museum of Modernisme and others offices for humanitarian organisations like Unesco. Most of Domènech’s residential structures in Barcelona are clustered between the Passeig de Gracia and Carrer Girona. The grandest of his palatial homes, Casa Fuster, now a five-star hotel, is at the top of Passeig de Gracia. About 50 miles northeast of Barcelona in the coastal town of Canet de Mar, Casa Roura, a little fortress of a house that is now a restaurant. The facade’s bravura brickwork creates a lively play of light and is further animated by turrets, parapets and gleaming roof tiles glazed in cobalt blue and canary yellow. Around 1909, Domènech expanded the original fortified stone house called Castell Santa Florentina, in Canet de Mar, deftly mixing his neo-Gothic riffs with authentic Gothic architectural elements like columns, portals and arcades “harvested” from a defunct monastery into a modernista masterpiece, one that quite literally spans the ages. The style of Lluís Domènech has been described as having logical, rational structures but with eccentric Hispano-Moorish decoration combined with the curves associated with Catalan Modernism. Domènech also employed a mix of materials such as mosaics, ceramics and stained glass, and made them work together in harmony. Unlike his Catalan modernist counterparts, Lluís Domènech managed to keep the structures he designed lightweight without compromising on the lavish decorations. By Mia Pujol, ESARQ-UIC team.